Having an incorrect lie angle on your golf club can have a huge impact on your ability to hit the ball straight. If your lie angle is too flat, you will tend to slice the ball. If your lie angle is too upright, then you will tend to hook the ball. It can even cause you to develop swing compensations to correct for it, preventing you from ever developing a consistent, repeatable, and powerful swing. Knowing what the difference is between a flat vs. upright lie angle is, how it affects your shot, and how to fix it can take strokes off your game quickly and even set you up to develop a better swing down the road. So let’s start with what these terms actually mean. Lie angle is a measure of the angle that is formed between the shaft of the club and the ground when the club head is in a normal playing position (typically the bottom of the sole is at least slightly rounded. One important piece of this that many golfers miss is that the lie angle that matters is the one at impact when you are swinging. It really doesn’t matter much whether the club head is flat when you are just holding it there in your stance. The best way to check your lie angle is with a piece of tape and a lie board. Remember, the lie angle that matters is where the club is when you hit the ball. A lie board will help you figure out if you have a flat vs. upright lie angle when you are taking a real swing and hitting a real ball. You can pick up a lie board pretty cheap on Amazon like this one. It is a very simple setup. The tape that is used for this test is white and it usually has a small line in the middle. You can get it here. A lie board like this is a cheap and simple thing that can make a huge difference in your game. You place the tape along the sole of the club with the line directly in the middle. You then place the lie board on the ground wherever you can hit a golf ball. That can be at a range, on a course, or just into a net at home. It’s a good idea to do this on a flat level lie so that there are no other factors affecting your swing. Then you simply place a ball on the lie board and hit it. After hitting the ball, look at the tape on the bottom of your club. Assuming you put the tape in the right place, there should be a small black mark on the tape. If the mark is right on the center line then you have the right lie angle for your swing. Another way to check your lie angle if you don’t have the tape and a lie board is to bring a sharpie to the driving range. Draw a straight line with the sharpie on one of the balls. There are little inexpensive plastic guides that will help you do this but if you don’t have one of them you can take a scorecard and line it up around the ball as a guide. Then place the ball in position to hit (either on the ground or a tee) so that the line you drew is perfectly vertical. This is the part where human error can skew this test a little so be careful. Once the ball is in place, set up normally and hit it. A flat lie angle means that the angle between the shaft and the ground is smaller, making the club shaft more flat as compared with the ground. If your club is too flat for your swing then it means that during your swing, the toe of the club will be lower than the heel (normally you want them level at impact). That can result in the ball slicing (curving to the right for a right handed golfer). There are a few reasons for this. In the case of an iron, it can result in the toe making contact with the turf before the center of the club face makes contact with the ball. That results in an open club face at the time of impact. But even if you are hitting off a tee and the club never makes contact with the turf, a lie angle that is too flat will result in a slice. Every club has loft, meaning the club face is angled upwards. When the club is tilted in one direction, that loft, which is normally angled straight up, now becomes tilted to one side or the other. That means that even if you hit the ball with the club face perfectly square to the target, the tilt (either too flat or too upright) will cause the ball to start angled to one side. It also adds side spin, so not only will your shot start off target, it will spin farther off target. In the case of a lie angle that is too flat, this means a slice. Since no one wants a ball that slices every time, you will eventually develop a swing that compensates for the incorrect lie angle just so you can try to hit it straight. This compensation means your margin for error is much smaller so you will be less accurate and when you do miss, you won’t be able to predict where the miss will end up. It also means that you are likely not swinging very efficiently and thus costing yourself some swing speed and distance. An upright lie angle means that the angle between the shaft and the ground is larger than it should be, making the club shaft more upright compared to the ground. If a club is too upright for your swing this means that during the swing, the heel of the club head will be lower than the toe. All the same problems above will occur, except the ball will hook (curving left for a right handed golfer). It is more common to find yourself with a club that has a lie angle that is too upright. That is because most amateur golfers tend to have a swing fault commonly referred to as “swinging over the top” which tends to result in a very upright position at impact. Club manufacturers don’t want to sell clubs that don’t work so when manufacturing clubs for the masses, they make them more upright to compensate for this common affliction. That doesn’t mean that an upright lie angle at impact is necessarily bad. There are plenty of PGA players that have upright clubs. But generally speaking, most golfers would benefit from clubs that are flatter than the ones off the rack. So keep this in mind when getting fitted. What Does 2 Degrees Upright Mean On A Golf Club? If a club is 2 degrees upright that can mean a couple different things depending on the context. Most likely, it means that a club is 2 degrees more upright than the standard lie angle for that brand and model. For example if a 5 iron has a standard lie angle of 62 degrees, but you either custom order it or have it adjusted to be a lie angle of 64 degrees, then it would be considered to be 2 degrees upright. So when most people say a club is 2 degrees upright (or 1 degree upright, 2 degrees flat, etc) then they are measuring it off of the standard off the shelf lie measurement for that particular club. It can also refer to the club being too upright for a particular person. 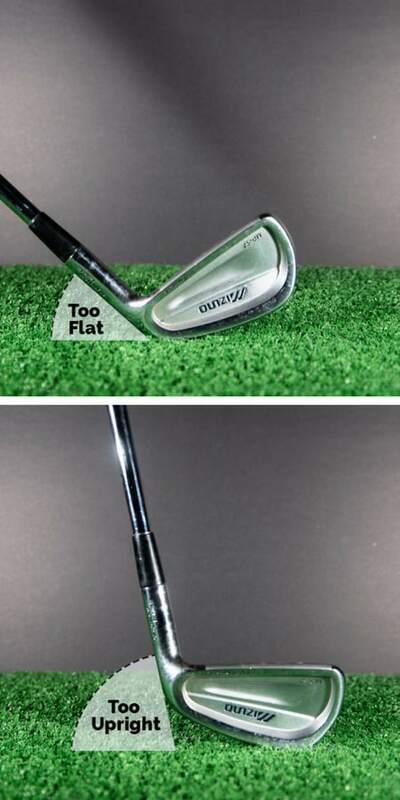 For example, if you went to a club fitter and your lie angle was measured and it was discovered that the club was too upright for you, then the club fitter may say that it is 2 degrees upright (which means it needs to be adjusted 2 degrees flatter to work for you). In that case, the measurement is based off of what is right for you rather than the manufacturer standard. Both of these are accepted ways to talk about lie angle, so depending on the circumstances of the conversation, it could mean either of them. This depends a lot on the type of clubs you have. Some types of clubs cannot be bent once they are manufactured. You have to order them to your specs. This is common among the big chunky game improvement irons. Trying to bend them will either be ineffective or just break the club head. If you are spending the money to invest in new clubs, I’d recommend making sure they can be adjusted. I’d also recommend getting them adjusted by a professional. Adjusting the lie angle is not like changing the grip on a golf club or even cutting the shaft down. It requires precision tools and measurements and a decent amount of skill to do right. Go find your local club maker to have it done. I used to swing way over the top and attack the ball with a very steep shaft angle. So after doing the tests above, I thought I needed a relatively upright lie angle on my clubs. Except the only reason I needed such a lie angle is because of a swing flaw. After recording my swing on video, it was painfully obvious that I had this huge swing flaw. So after talking to a swing instructor. I decided to have my clubs bent 2 degrees flat. I’m not that tall so it wasn’t all that extreme for me. At first I could barely hit the ball. Then after a while my results started to improve. After about a month or so, I recorded another swing. It wasn’t perfect, but my huge over the top move was greatly minimized. I was on my way to a more efficient and consistent swing. It can be remarkable how the body can adjust and compensate, either positively or negatively. So don’t rely just on testing your lie angle. Get some video, get evaluated by an instructor and make adjustments from there. Lie angle is one of those things that you never think about but can make a tremendous difference once you get it right. 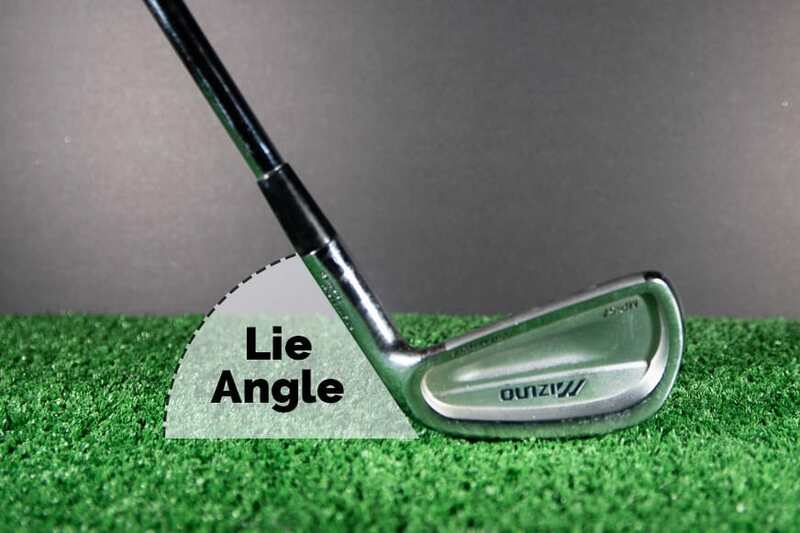 Have you had your lie angle tested? Did it make a big difference in your swing or your scores? Did I miss talking about something important? If your club is too flat for your swing then it means the toe of the club is lower than the heel (normally you want them level at impact). An upright lie angle means that the angle between the shaft and the ground is larger, making the club shaft more upright compared to the ground. This means that the heel of the club head is lower than the toe. Above is from your article flat vs upright. I always thought flat means that the heel of the club is on the ground. So wouldn’t the toe be high in the sky? Upright would be that the toe of my club is hit the ground and the heel is higher. When I read the article I upderstood you saying the opposite. Am I just confusing the terms you used? Tony, you are 100% right. I had a couple typos in there that are now fixed. The general principles are still accurate as are the images. Thanks for picking that up. Lie angle is a tough one to explain in text! It is nearly impossible to diagnose something like that without seeing some video. Only thing I would say is that they may have fitted you for 1 degree upright because you are swinging over the top a bit which causes you to come in steep and cast the club. So the upright clubs are just fitted to a swing fault which can prevent you from fixing the swing fault. That is just speculation because I haven’t seen your swing but it is very common. Seeing an instructor in person would be able to give you a better diagnosis though.